I’ve done more than my share of flying. Some rough math tells me I’ve flown between Atlanta and New York alone some 500 times. My Delta SkyMiles account says that I’ve flown close to 2 million miles over the last 20 years. By now you know that I love to read more than just about anything else. And flying always reminds me that I’m not alone; everyone seems to be reading on airplanes. And although bookstores are struggling to survive, airport bookstores will probably be the last to disappear. 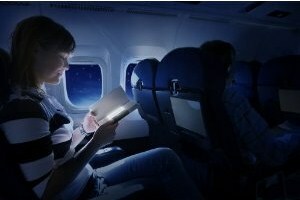 Don't you wish that reading on airplanes was always this pleasurable? Flying is so synonymous with reading that “airplane reading” has been part of our lexicon for decades. Heck, my philanthropic brand GoneReading™ is entirely based on the idea that people want to get away and read. Ask 10 people why they love to read, and I’ll bet eight will say it’s because reading helps them to escape from their day to day lives. Yes, reading and air travel go hand in hand. Unfortunately, reading in-flight can present its challenges. One evening years ago I experienced the joy of boarding a 5+ hour flight, eager with anticipation for the ancient history classic in my bag. After takeoff, I looked up to see that the bulb for the so-called reading light was completely missing. I will never forget the flight attendant’s calm voice assuring me that it wasn’t a problem: She’d already filed a service request with the maintenance department back in Atlanta. Awesome. And we’ve all met the talkers on airplanes. If I’m reading a book with my headphones on, not looking your way and not even responding to your pointless questions, isn’t it clear that I don’t want to talk? Even faking a nap doesn’t make the point; I’ve tried. Which brings me to the subject of this article, what is surely the best idea the airlines will never adopt: ReaderClass. A special section of each airplane dedicated to people who are planning to read during all/most of the flight. A talk-free zone; maybe my favorite aspect of ReaderClass. Shut up and read. No infants or toddlers. If they’re not going to read to themselves throughout the flight, sit elsewhere. Extra bright reading lights (with spare bulbs on board). An electrical outlet for charging my eReader of choice. Extra wide seat pockets for holding my reading material/device of choosing. Complimentary noise reduction headphones upon request. And here is why I think the airlines should pay attention: I’m pretty sure people would pay an up-charge for ReaderClass. I know I would pay enough to make it worth their time, and I’m sure I’m not alone. Prove me right or wrong by commenting below. How much extra would you pay, if anything? Let’s start a movement. Worst case, if it doesn’t happen we will all have one more reason to hate the airlines. This entry was written by Brad Wirz, posted on June 12, 2011 at 12:01 pm, filed under Uncategorized and tagged airline, delta, flying, readerclass, reading, traveling. Bookmark the permalink. Follow any comments here with the RSS feed for this post. Post a comment or leave a trackback: Trackback URL. This gives me an idea for a product that will empower readers so that they don’t have to wait for airlines to catch up to the awesome Reader Class idea. Envision, if you will, the Gone Reading Helm. Fully-enclosed, with noise-cancelling tech, a built in e-reader dual eyepiece, and an outer graphical interface that communicates silently but powerfully the Reader’s displeasure with nearby noisy and awful people. Nothing, after all, communicates “Hey! I’ve Gone Reading! Please be quiet!” to some garrulous, insensitive boor sitting next to you on a long flight like a bright LED display that says “Hey! I’ve Gone Reading! Please be quiet!” Think the Helm might get stuffy? Not so! Climate control is achieved by circulating coolant whose temperature can be adjusted easily by the Reader. Not that I think there’s anything wrong with the Reader Class idea. I just think it’s less likely to happen. Bring it on Sobifall. Appreciate the enthusiasm.